Peter Smith introduced his press around 1821 with a toggle mechanism that distinguished it from other iron hand presses (some of which also have acorn frames). See the Cincinnati Type Foundry’s Smith (Cincinnati) press for more information. The press pictured is another of the exquisite replicas made by Steve Pratt of Pratt Wagon Works. 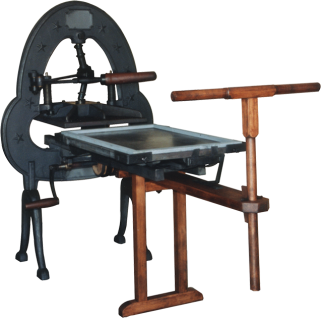 Modeled after an 1825 Smith, it weighs 1400 pounds and is currently in an historic print shop (name unknown) in Palmyra, New York. See also Pratt’s Gutenberg interpretation on view in the Museum.